Connecting to a Wi-Fi network for using the internet is fairly simple. When your device finishes searching for available Wi-Fi network, you have to enter the password and your device will connect to the internet. One of the main advantages is you don’t have to re-enter the password manually every time you connect to the internet. Your iPhone will remember the password for that particular Wi-Fi network. As you don’t have to enter the password every time, you might forget the Wi-Fi password easily. So, what to do if you want to connect other devices to the same Wi-Fi network? There are some top methods that will help you recover Wi-Fi password on iPhone. If you jailbreak your iPhone, the warranty from Apple becomes void and it is also illegal to do so. Luckily there are various other methods to find and recover Wi-Fi password on your iPhone. You can use iCloud Keychain to find and recover Wi-Fi password on iPhone. The iCloud Keychain allows you to sync all the data including saved passwords with all other Apple devices if you use the same iCloud account across those devices. Notes that this method needs a Mac computer. 1. Open Settings on your iPhone and go to iCloud. Tap on iCloud Keychain to turn it on. 2. Go back to Settings and turn on Personal Hotspot. 3. Now, turn on your Mac and connect it to your iPhone’s Personal Hotspot. The setup is over. Now, you can view the saved passwords by following the steps given below. 4. Open Spotlight Search (CMD + Space) on your Mac and tap “Keychain Access” to enter. 5. Type in the network’s name and click on “Show Password” option. 6. If the Mac account is protected by a password, you will be asked to enter the admin password. After you enter the password, you can view the forgotten Wi-Fi password in the field next to Show Password. 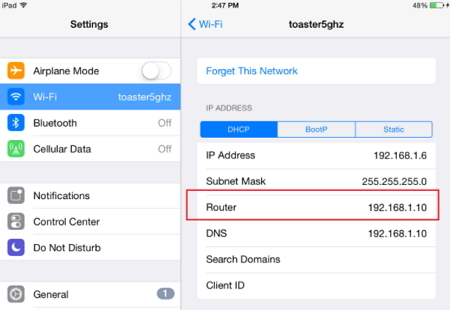 On iOS devices, you can also find the Wi-Fi password with router settings by following simple steps. 1. Open Settings and go to Wi-Fi. All the network names will be displayed. 2. Tap on circular (i) icon on the name you want to recover password for. Copy the IP address of the router. 3. Open Safari and enter the copied IP address and press Enter. 4. You will be greeted with the login panel page of your router. 5. Enter the default username and password, which must be “admin”. If “admin” doesn’t work, you can search for the default password of your particular router on Google. If you have a jailbroken iPhone and you still want recover Wi-Fi password on iPhone, you can use some Wi-Fi password recovery apps. Here is an example of it. Open Cydia from your home screen and search for “WiFi Passwords”, which is a free app for finding and recovering the Wi-Fi passwords on iPhone. 1. Install the app by tapping on “Install” on the top right corner. 2. After installation, click on “Return to Cydia” and then return to Home screen of your device. 3. Open the WiFi Passwords app and view all available Wi-Fi network and their passwords. 4. Click on your preferred network to connect. For now, there are not many software available to recover Wi-Fi password on iPhone. But, iMyFone is working on it and very soon, the iPhone users will be able to recover Wi-Fi password directly using advanced software from iMyFone. Step 1. Launch this software on your computer. Click Start button and connect your device to computer successfully. Step 2. Then you can scan your device. If you have set password for it, you need enter the password in order to allow the program to access the data on your device. Step 3. Once scanning completes, all WiFi information will be shown. Just hit Export button to save. All the methods given above will help you to recover Wi-Fi password on iPhone easily. You can check and try the best method for the recovery purpose. If you are looking to recover the lost Wi-Fi passwords directly on iPhone, you need to wait patiently. Let us know in the comments section if you have any other queries regarding Wi-Fi password recovery.